Workshops are a playground to give us the time and space to explore musicality deeper. My strength is to convey my love for music, singing and listening in an ambiance of lightness so that celebration and meditation can become natural. I am always looking for what helps our listening sensitivity to expand. Music itself is a wonderful guide. I enjoy working with partners such as Pascale Mukti Beaudry and Tatini Buunk who have accompanied me many times. Both are experienced therapists and lovers of meditation and lead groups in relaxation and inner growth work. 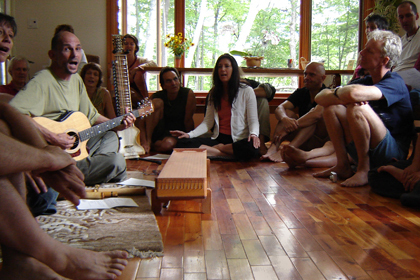 During a workshop we alternate between singing, movement, meditation and sharing. In listening meditations we together explore the sound of different instruments like the cello, Indian dilruba, percussions and flutes. Stretching and breathing exercises open the body and voice to more resonance. Dance rituals support our sensitivity towards essential human elements such as trust and loving kindness. In this field of self-awareness and musicality we can naturally experience silence, wisdom and simplicity. Workshops usually last for one or two days. Find your sensitivity in the world of sound – while listening, singing or playing music.